A two-day Planning Workshop on the preparation of Project Procurement Management Plan and Annual Procurement Plan for FY 2019 was conducted on August 7-8, 2018 at One Tagaytay Place Hotel Suites, Tagaytay City. The workshop aims to: revisit APP 2018 in order to identify Priority Improvement Area for 2019; re-orient participants on the standards and procedures in crafting Work and Financial Plan; and prepare Project Procurement Management Plan and Annual Procurement Plan for 2019. Present during the said workshop are the Schools Division Superintendent, OIC-Assistant Schools Division Superintendent, Technical Working Group composed of SDO personnel: Supervisor and Unit Heads and the participants: School Heads, BAC Chairmen and Property Custodians of the 29 Public Schools in Pasay City. In the presentation of Final Division Educational Development Plan, held on day 1 of the said workshop Dr. Evangeline P. Ladines emphasized the adherence of the Division to the Strategic Plans of Regional and Central Offices. She mentioned and urged everyone towards its realization. On the same day, the following topics were presented and discussed: Midterm Plan by Dr. Melody P. Cruz, OIC – Assistant Schools Division Superintendent, Project Programs and Activities in the Perspective of Finance by Mrs. Cecilia B. Baylon, Planning Officer III ,National Expenditure Program(NEP) and the 2019 National Budget by Mrs. Loida C. Dasco, Budget Officer III, Division Calendar of Activities by Dr. Imelda V. Boquiren, Education Program Supervisor and the Review and Evaluation of the 2018 Annual Procurement Plan (APP),Project Procurement Management Plan (PPMP) through the Procurement Monitoring Report (PMR Form) for 2018 which was facilitated by Ms. Eden E. Dioquino, School Head of Padre Zamora Elementary School and the Division BAC Secretariat Chair. 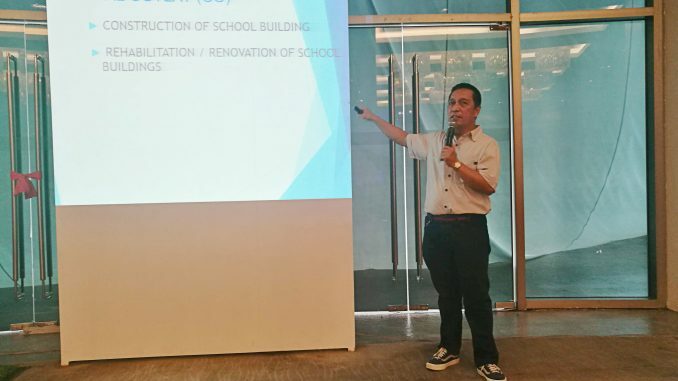 The day 2 of the workshop highlighted the presentation of the PPMPs and APPs of Maricaban Elementary School Pasay City, National Science High School, Pasay City East High School and the Schools Division’s Office. During the processing of the presentations, Dr. Ladines shared her expertize on planning and budget allocation. She has given constant reminder to the School Heads with regard to the alignment of the plans and its significance must be set on the priorities of the schools. Mr. Ronel U. Arellano, Supply Officer and the facilitator of the workshop expressed his thoughts and guided the participants in the formulation of the final PPMPs and APPs. The two-day engagement commenced with the closing program. The impressions were delivered by Ms. Norma Jamon, Principal Juan Sumulong Elementary School, and Ms. Elsa Floria, Master Teacher and BAC chairman of Andres Bonifacio Elementary School and the Challenge posed by Dr. Melody P. Cruz, OIC-Assistant Schools Division Superintendent and the Commitment by Dr. Cynthia Abella, Assistant Principal of Pasay City South High School. The awarding of certificates to the facilitators and Technical Working Group was also held during the said program.